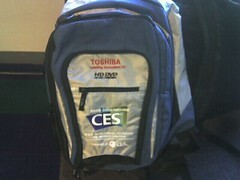 This great backpack from Toshiba, who was going to be out in force at CES to promote the HD-DVD standard, is a poignant reminder of how fast and furiously things change in the tech industry. Warner’s decision to go Blu-Ray was just yesterday but it’s already created a potential melt-down for HD DVD (Toshiba’s preferred and supported standard). Several HD-DVD folks have reported cancelled conference activities and events – but those are just rumors so far. This entry was posted in CES, CES 2008, companies, computers, conference and tagged CES, CES 2008, Las Vegas. Bookmark the permalink.